After reading, studying and thinking about Lean over the past seven years, I am convinced that Veterinary practice and Lean are destined for each other. As veterinarians and systematic problem solvers, we already know and are familiar with over eighty percent of Lean; we just don’t know it. Lean promotes greater value for the customer (from the customer’s perspective), with higher quality, better utilization of all resources (especially our human resources), less expense and increased engagement of staff. I think most veterinarians want the same things. Lean is the Western name for the Toyota Production System (TPS). Coined for its ability to remove the “fat” (wastes or muda) from processes. Toyota developed TPS in an effort to rise out of war torn Japan, with its limited resources, to be able to go beyond truck manufacturing for the small, Japanese economy to complete with the American auto giants in a global economy. Since then, most other industries have found successes with Lean, including human healthcare. Can it do for veterinary medicine what it has done for many hospitals and healthcare system around the world? I think it can and that we need to try. First of all, Lean takes a systems approach to problems. Problems are examined from a systems breakdown perspective before people are blamed. Lean asks “Why did this happen?”, or “How did this happen?” as opposed to “Who is responsible?” As doctors, we work with systems in our patients every day. We understand inputs, outputs, delays and feedback loops, both positive and negative. We know what can happen when one system is changed and how it can affect other systems for the better or the worse. In order to identify the abnormal, we must first understand what is normal; what is ideal for this species, breed or animal. In veterinary school, we learned normal anatomy and physiology before we studied pathology. The same concept is true for Lean. We must have a very clear idea of what our ideal practice would look and function like. Notice, that I did not say an ideal practice. 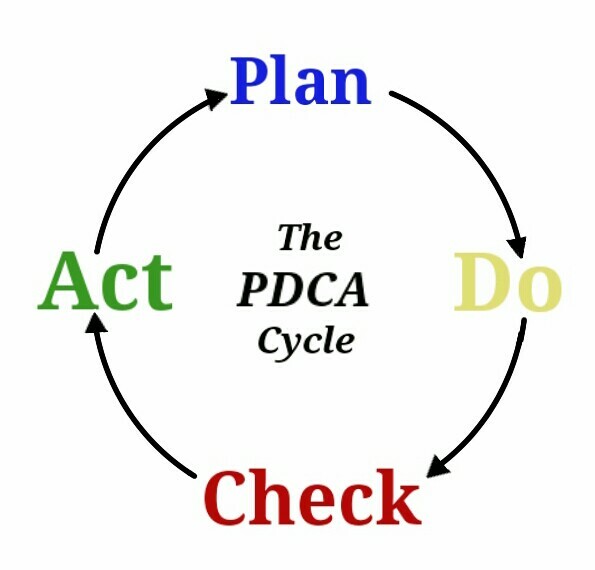 Lean is not trying to make your practice some management guru’s idea of the perfect “cookie cutter” practice. Lean understands that your practice is unique. The doctors are different. Their biases, philosophies and perspective are unique. The neighborhood where your practice is located is different than other neighborhoods. The mix of your employees is one of a kind. The Lean objective is to make your practice the best “your” practice it can be, now and into the future. In the Lean mindset, this ideal is called our “True North.” What would your practice look like if it was perfect? How would your practice perfectly relate to your clients? What would your ideal staff look and function like? How would your practice benefit your neighborhood and community if it is was perfect? It’s totally up to you. What ever you decide your True North is, Lean is designed to get you there. Forget, what a “Top 100 Best Practice” says you should be. What is important from the Lean perspective is that you are closer to your True North today than yesterday; closer this month than last month. The perpetual destination of the Lean journey is perfection, knowing full well, of course, that this is impossible. The Lean journey never ends. As Vincent Lombardi said, we pursue perfection, knowing we will never get there, in order to reach excellence. As veterinarians, we are already quite familiar with eighty percent, or more, of the Lean methodology. We just don’t know it. Both mindsets are based on the scientific method of problem solving. When a sick pet comes into our practice, health is our goal, our ideal state. The first step in diagnosing that pet is to understand fully the current state of that patient. We start with the primary client complaint. Regardless of whatever else we discover, we want to make sure we address this problem. 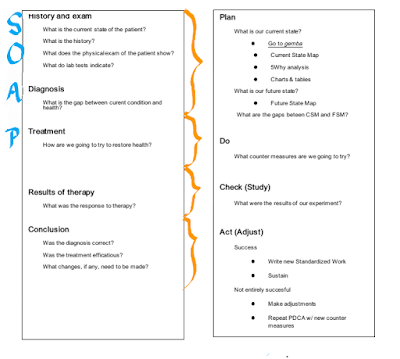 Next, we collect a complete history; vaccinations, diet, current medications, symptoms and their progression, etc. The second step is to perform a complete “tip of the nose to tip the tail” physical exam, paying particular attention to the client’s primary complaint. Can you imagine trying to make a diagnosis without performing a physical exam on the patient? Next, we might perform diagnostic tests, such as a complete blood count, a general organ profile, urinalysis, radiography, and specific serology tests. We are attempting to explain why the patient is having the symptoms it is having. Medicine is based on facts, objective data, not fantasy. At this point, we should have a reasonable understanding of the pet’s current state of health. Now, because we know what the ideal state of health is for this species, breed, gender and age, we can identify the problems; the gaps between our patient’s current state and the ideal state. Based on our problems list, we formulate a treatment plan. This is an experiment. We don’t know if our treatments will work, but we decide, maybe with consultation with colleagues and specialists, what we are going to do. Later, we will follow up with the client and pet in order to analyze if we were successful at reaching our ideal state of health. If we were successful, we will set a time for the next review, maybe in six months or a year. Remember the 3Rs; Recall, Re-examine or Reminder? If we were not successful, we reflect on what went wrong and start the process over again with additional history, another, possibly more in depth, physical exam, additional tests, a second, adjusted round of treatments (another experiment) and another analysis of the outcome. As I said, the Lean methodology of management problem solving is also based on the scientific method. The process is almost identical to the one described above for diagnosing and treating sick pets. So how do we know we have problems? Because we have not reached our ideal state in one form or another. Defining the current state also includes an essential “physical exam.” In Lean, this is called “going to gemba.” Gemba is the Japanese word for the work floor, the place where the work (and problem) actually occurs. For instance, if the problem has to do with surgery, then the surgery room is the gemba. Lean emphasizes the importance of physically observing the flows and processes (the “value stream”) in real time in order to deeply understand the current state as it really is. A big difference in the Lean mindset, however, is that this observation (physical exam) should take place with the staff that are there on the floor, because they know better than anyone what the real issues are. They deal with it every minute of every day. They are an organization’s most valuable asset and resource, especially for helping to identify and provide solutions to problems. Lean promotes partnering with employees in this effort. Our staff wants to be part of the process of finding solutions, rather than always being seen as the cause of problems. This is a big part of what engages them. Now, as in the diagnostic process, we can identify the gaps between our current state (disease) and our True North (health). However, many problems can appear to be caused by a particular cause when, in fact, it is caused by something much deeper; something more basic. Just as not diagnosing and treating the real problem versus treating symptoms will probably not yield a cure for or patients, not solving problems at their root cause will not provide a permanent solution to the problem at hand. 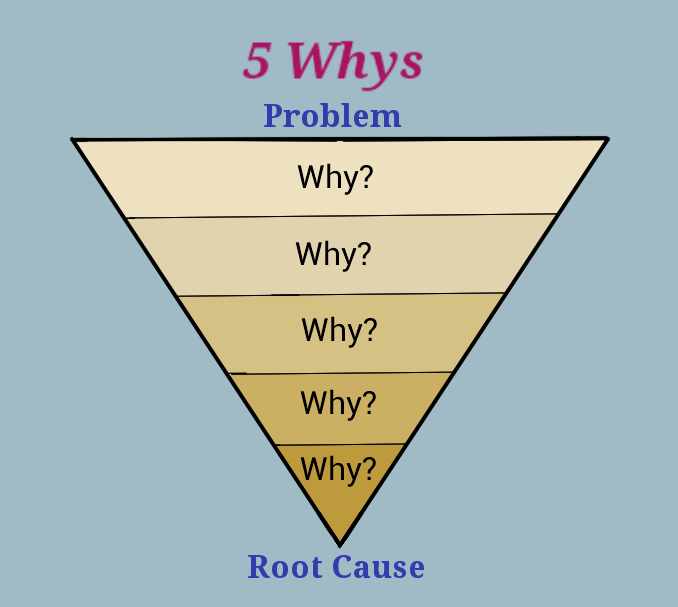 So, in Lean there is a “diagnostic” called “5 Whys.” This is the idea that one should ask “why” five times to insure the root cause has been identified. A fix for anything less will not solve the problem once and for all. The number five is somewhat arbitrary. It could be four or it could be seven. 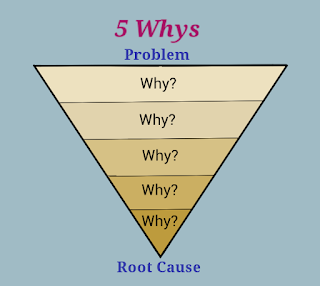 The idea is to ask enough times that the root (absolute) cause has been identified. Does it ever seem like you are having to deal with the same problems over and over again? As if you are constantly playing the game “Whack-A-Mole?” As soon as you think a problem has been squashed in one place, it “pops up” again somewhere else? One of the main reasons for this could be the fact that the root cause (the definitive diagnosis) has not been found (another reason could be that your unique, valuable and knowledgeable staff played no part in the process). That it has always only been handled with “Band-Aids.” And, all of this effort is found to be just a waste of time and effort. Once we know the gaps between our current state and our ideal state, we, in dialogue with our staff, can devise the counter measures (treatments) we feel are indicated. This is an experiment, also, since we don’t know if it will work. It will give us an idea of what the future state should look like. Since our True North, or ideal state, is perfection, and we know that is impossible, then the best we can do is aim for the next, improved, future state. Lean is a journey that never reaches its final destination of perfection. It is the process of continuous improvement toward ever better future states. We can never reach our True North, but with constant effort, we can get really, really close! The final step, as with our patients, is to study the results of our tiny experiments. If the results are positive, then we institute it as the new, best method or standardized work and the staff is trained to this new current state. We will continually, from time to time revisit this process in order to improve it even more down the road. If our “treatments” does not turn out well, then we (along with staff) will make adjustments and start the whole process over again with different countermeasures and experiments. I hope it is evident, now, how much diagnosis and treating patients in our veterinary practices is similar to the Lean methodology of management and problem solving. I told you that you knew more about Lean than you realized! We are all familiar with the SOAP format for writing medical record. 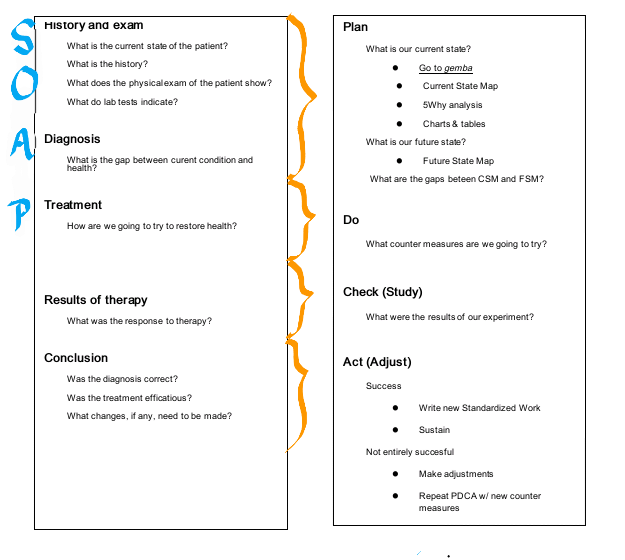 “S” stands for “Subjective, “O” stands for “Objective”, “A” stands for “Assessment” and “P” stands for “Plan.” The Subjective and Objective parts define the current state of the patient. Assessment delineates our tentative diagnosis. Plan communicates our, hopefully, successful treatment. It is not the medical record that is so important. It is the diagnostic thought process that is important. We could write medical records with a different format, but the thought process is the same, regardless. In Lean, the written document is called an A3 report because it was written on an A3 sized (approximately 11 inches by 17 inches) piece of paper which was the largest paper that would fit in a fax machine at the time. 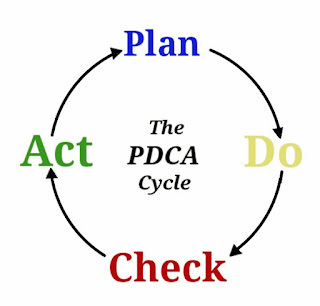 It is based on the Deming (named for the American, W. Edwards Deming, one of the first to use statistics for quality control and improvement) or PDSA cycle that is the thought process. “P” stand for “Plan.” In this part of the report (which typically occupies about 50% of the entire report), we provide a statement of the problem, any 5 Why analyses, the necessary information (e.g. data, charts, graphs, Value Stream maps, etc.) to describe our current state, possibly a Future State map, and any cost estimates relevant to the experiment . Following is the “D” or “Do” section. This section delineates the proposed countermeasures we will experiment with. Next is the "C" or "Check" (some use “S” or “Study”) portion of the report. Here, we explain and study the results of the experiment. The final section is the “A” section which stands for “Act” or “Adjust.” Here, we reflect (hansei) on the results of our experiment. If it was successful, then we act on the results by instituting them within the practice. If not, we adjust, come up with new countermeasures and experiments in a new PDSA cycle and A3 report. Again, it is not the format of the report that is important (although the idea that everything should be concise enough to fit on one A3 sized paper is an important aspect), it is the process (called A3 thinking) that is. Because the diagnostic process and Lean problem solving are both based on the scientific mindset, both reports are similar. More that we didn’t know that we know! Thanks for visiting. Tell your friends about the blog!